Ready to take your loungewear to new heights? You can always count on your fairy shopmothers at Shop With Us to keep you stylish and cozy. Nordstrom is our favorite go-to for fabulous finds and this Henley Top has left us swooning. Cruising through the racks at 40 percent off, this flowy style is our newest obsession. The airy top has a scooped neck and five-button placket detailing, allowing you to embrace ultra-feminine style for a fuss-free look. With neutral colors like black, white and olive green on sale for only $40.80, you can look forward to a breezy update without leaving your bank account in shambles. Linen-blend fabrics are the key for a summer-appropriate tee and this one delivers. 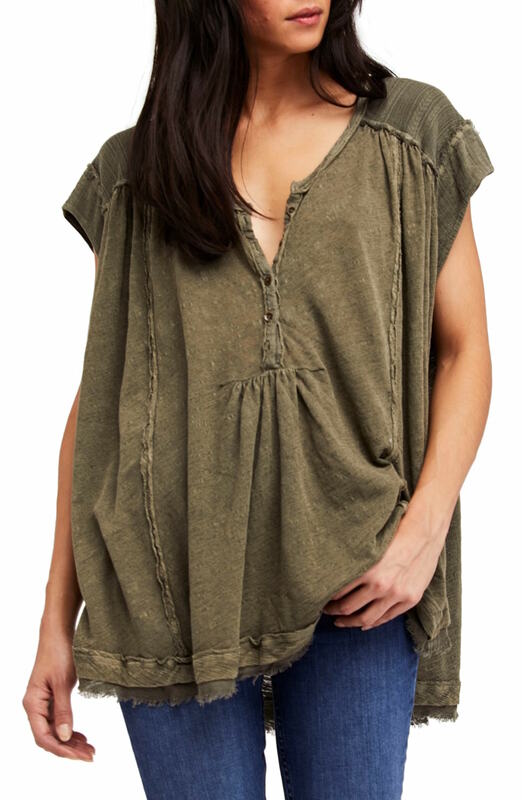 Its soft construction can easily tuck into jeans or be draped over leggings for an easy-breezy look. Many shoppers noted how great it looks with a variety of bottoms, while others loved how flowy and lightweight the henley feels. Some shoppers advised sizing down in the Free People t-shirt, as it runs fairly oversized while others note the neckline, and look, can uniquely be adjusted thanks to the multiple buttons. Pair with your favorite leggings for a look that’s made for a Sunday afternoon Netflix binge. Thinking of a romantic vibe? Team with skinny jeans, strappy sandals and a glossy lip for a breathtaking look. Scoop up the Free People Aster Henley Top on sale for $40.80, reduced from $68 (a total of 40 percent off)!